1st Place - Frank M. - 65 Points, 59.22 lbs. 11th Place - Bob S. - 28 Points, 26.34 lbs. 2nd Place - Ralph S. - 64 Points, 71.90 lbs. 12th Place - Jeff L. - 26 Points, 22.55 lbs. 3rd Place - Bill G. - 63 Points, 76.45 lbs. 13th Place - Tim S. - 19 Points, 11.44 lbs. 4th Place - Rich B. - 62 Points, 57.64 lbs. 14th Place - Scott J. - 10 Points, 7.36 lbs. 5th Place - Duane B. - 61 Points, 55.35 lbs. 15th Place - Joe G. - 10 Points, 4.08 lbs. 6th Place - Jon W. - 59 Points, 70.44 lbs. 16th Place - George D. - 3 Points 4.23 lbs. 7th Place - Bruce H. - 56 Points, 55.01 lbs. 9th Place - Jody W. - 48 Points, 42.85 lbs. June 4th Hopatcong 1st Place Duane B. - 8.27 lbs; 2nd Place Rich B. - 8.17 lbs; 3rd Place Jeff L. - 6.40 lbs; 4th Place Barry N. - 6.22 lbs; 5th Place Jody W. - 6.09 lbs; 6th Place Bill G. - 5.15 lbs; 7th Place Jon W. - 4.92 lbs; 8th Place - Bob S. - 3.91 lbs; 9th Place - Frank M. - 2.49 lbs; 10th Place - Ralph S. -1.31 lbs; Lunker Duane B - 2.74 lbs. June 18th Cranberry 1st Place Jon W. - 12.63 lbs; 2nd Place Scott J. - 7.36 lbs; 3rd Place Brett M.- 6.58 lbs; 4th Place Rich B. - 4.66 lbs; 5th Place Tim S. - 4.48 lbs; 6th Place Tim S. - 4.48 lbs; 7th Place Bruce H. - 4.46 lbs; 8th Place - Bill G. - 2.95 lbs; 9th Place - Ralph S. - 1.90 lbs; 10th Place - n/a; Lunker Jon W. - 3.77 lbs. July 9th Fairview 1st Place Jon W. - 7.80 lbs; 2nd Place Barry N. - 4.83 lbs; 3rd Place Ralph S.- 3.77 lbs; 4th Place Frank M - 2.13 lbs; 5th Place Tim S. - 2.03 lbs; 6th Place Jody W. - 1.51 lbs; 7th Place Bruce H. - 1.50 lbs; 8th Place - Rich B. - 1.14 lbs; 9th Place - Bill G. - 1.04 lbs; 10th Place - n/a; Lunker Jon W. - 2.21 lbs. July 16th Beltzville 1st Place Rich B. - 5.72 lbs; 2nd Place Bruce H. - 5.56 lbs; 3rd Place Ralph S.- 5.44 lbs; 4th Place Jon W. - 4.66 lbs; 5th Place Bill G. - 3.98 lbs; 6th Place Duane B. - 3.95 lbs; 7th Place Barry N. - 2.27 lbs; 8th Place - Jody W. - 1.41 lbs; 9th Place - n/a; 10th Place - n/a; Lunker Bill G. - 3.98 lbs. August 5th,6th Keuka - 2 Day 1st Place Bill G. - 16.63 lbs; 2nd Place Duane B. 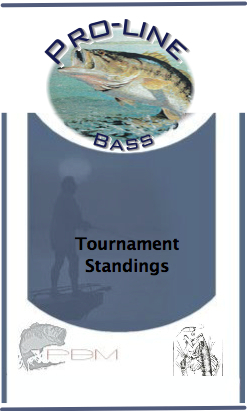 - 16.27 lbs; 3rd Place Ralph S.- 11.91 lbs; 4th Place Jody W. - 10.87 lbs; 5th Place Jon W. - 10.33 lbs; 6th Place Rich B. - 6.75 lbs; 7th Place Barry N. - 6.34 lbs; 8th Place - Bruce H. - 3.98 lbs; 9th Place - n/a; 10th Place - n/a; Lunker Duane B. - 3.98 lbs. August 19th Night Tournament Wallenpaupak 1st Place Frank M. - 13.39 lbs; 2nd Place Ralph S. - 9.16 lbs; 3rd Place Barry N. - 4.39 lbs; 4th Place Joe G. - 4.08 lbs; 5th Place Jody W. - 2.61 lbs; 6th Place Brett M. - 1.67 lbs; 7th Place Rich B. - 1.30 lbs; 8th Place - Jon W. - 1.13 lbs; 9th Place - n/a; 10th Place - n/a; Lunker Frank M. - 6.46 lbs. September 17th Harvey's 1st Place Frank M. - 6.36 lbs; 2nd Place Rich B. - 5.25 lbs; 3rd Place Bill G. - 5.20 lbs; 4th Place Jody W. - 3.49 lbs; 5th Place Barry N. - 1.94 lbs; 6th Place Bob S. - 1.85 lbs; 7th Place Jon W. - 1.69 lbs; 8th Place - n/a; 9th Place - n/a; 10th Place - n/a; Lunker Rich B. - 3.58 lbs. October 1st Greenwood 1st Place Duane B. - 9.71 lbs; 2nd Place Bruce H. - 9.64 lbs; 3rd Place Ralph S. - 8.50 lbs; 4th Place Jeff L. - 6.80 lbs; 5th Place Frank M. - 6.26 lbs; 6th Place Bill G. - 6.06 lbs; 7th Place Brett M. - 3.63 lbs; 8th Place - Barry N. .95 lbs; 9th Place - n/a; 10th Place - n/a; Lunker Bruce H. - 4.02 lbs. October 15th Hopatcong 1st Place Ralph S. - 6.27 lbs; 2nd Place Duane B. - 1.38 lbs; 3rd Place Bill G. - 1.10 lbs; 4th Place Frank M. - 1.04 lbs; 5th Place Jodi W. - .90 lbs; 6th Place Rich B. - .85 lbs; 7th Place n/a; 8th Place - n/a; 9th Place - n/a; 10th Place - n/a; Lunker Ralph S. - 3.61 lbs.